Situated at the corner of Peachtree Street and Fifth Street, 805 Peachtree Lofts is one of the more unique loft conversions you’ll find in Atlanta. Comprised of 118 individual loft residences, buyers will usually find one or two units listed on the market at any given time here, although keep in mind demand for lofts for sale at 805 Peachtree always seems to be high. The building was originally built back in the early 1950s and was once the home of the Department of Agriculture and even the early offices for the CDC. But in 1995, 805 Peachtree was redeveloped into residential use and was then converted into loft condos back in 1999. Lofts at 805 Peachtree feature studio, one, and two bedroom floor plans, so there’s something for just about everyone who might be looking for an authentic loft here in one of Atlanta’s hottest neighborhoods to call home. 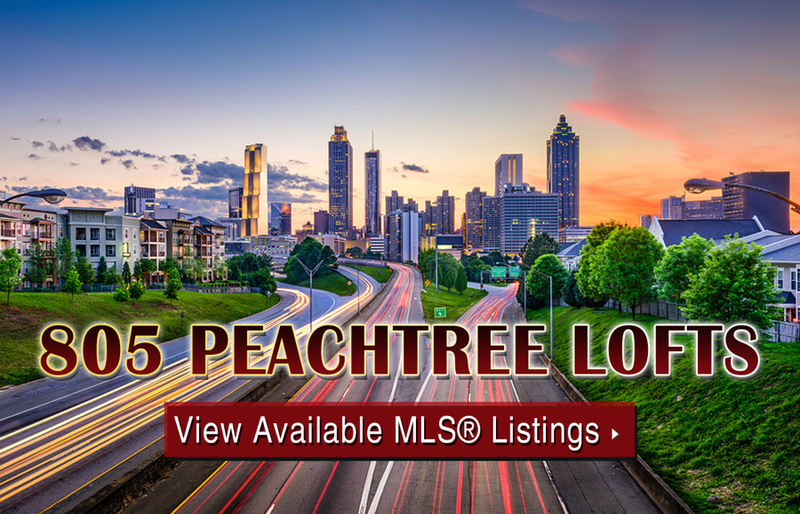 If you’d like more information about 805 Peachtree lofts for sale in Atlanta, call us today at (404) 564-7272, or click below to start browsing active listings at this amazing Midtown condo development. Listed below are recently closed sales at 805 Peachtree. Whether you’re thinking about buying or selling a unit at 805 Peachtree, checking to see what other comparable properties have sold for in recent weeks and months provides helpful insight into current market conditions for the building. For more information about 805 Peachtree lofts for sale or for a complete list of recent condos sold in the neighborhood, contact The Zac Team today! Positioned right in the heart of Atlanta’s Midtown neighborhood, 805 Peachtree Lofts provide residents with plenty of nearby amenities and attractions, as Piedmont Park, the High Museum of Art, the Atlanta Botanical Gardens, and the Fox Theatre are all well within walking distance from the building’s location. Easy access to MARTA is also right up the street from 805 Peachtree Lofts, only adding to the convenience of calling this one-of-a-kind building home. For a closer look at what else is near 805 Peachtree Lofts, check out the map below. Not all loft conversions in Atlanta offer the kind of lifestyle amenities you’ll find at 805 Peachtree, which is also what makes living here so desirable. Listed below are just some of the common building features you’ll find here at 805 Peachtree Lofts. Can’t find what you’re looking for at 805 Peachtree Lofts? Start browsing other Midtown real estate for sale or give the Zac Team a call at (404) 564-7272 for help with your new home or condo search today!